This is a fantastic reference and tutorial book for those who are into screen printing. You do need to have access to basic screen printing equipment and materials if you're going to go through the tutorials. And be prepared to get your hands dirty because there are lots of hands-on step-by-step tutorials. You'll get to learn about the tools, materials and equipment required, the different techniques possible and what to do when mistakes happen. The bulk of this 288-page paperback book is filled with tutorials. There are plenty of large pictures to look at. The back of the book features selected artists and studios who are into screen printing. It's a good resource to check out as well to get inspired at what others do and also open your mind to the potential of this media. All the tutorials are from Print Club London, a humble establishment founded by Fred Higginson and Rose Stallard in 2007. It has since grown to occupy a warehouse that's utilised by many other artists. The story of their growth is quite inspiring, and so are the artworks they out out. 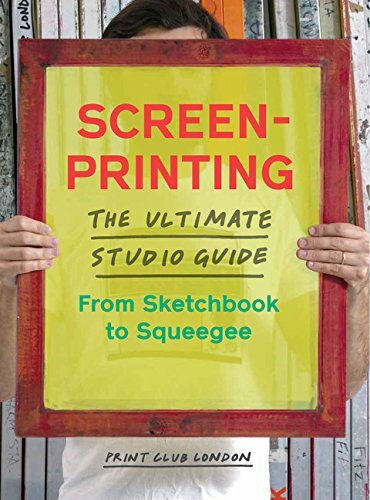 This is a insightful and informative book on screen printing.